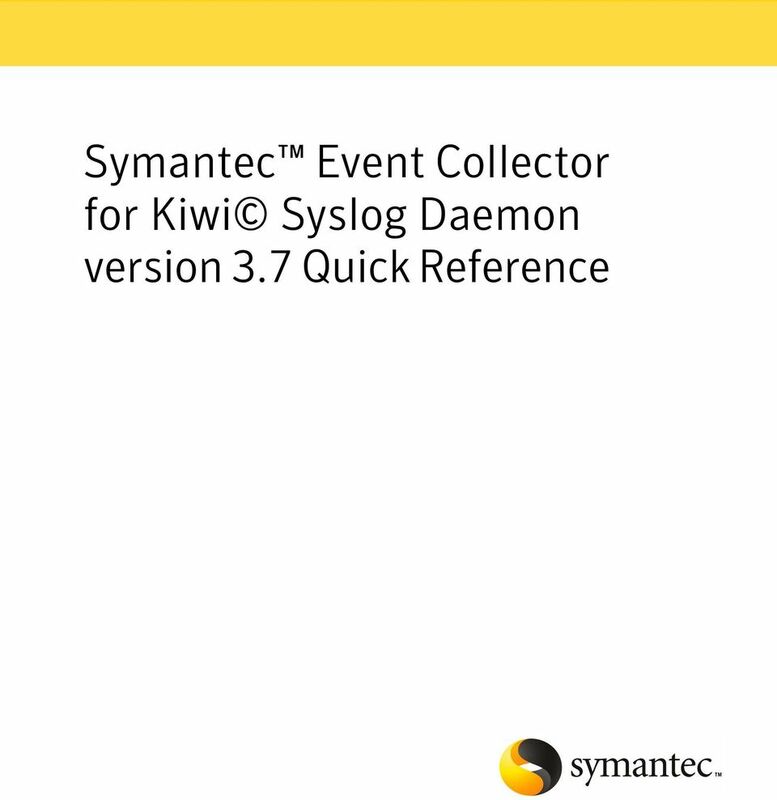 Download "Symantec Event Collector for Kiwi Syslog Daemon version 3.7 Quick Reference"
2 Symantec Event Collector for Kiwi Syslog Daemon Quick Reference The software described in this book is furnished under a license agreement and may be used only in accordance with the terms of the agreement. 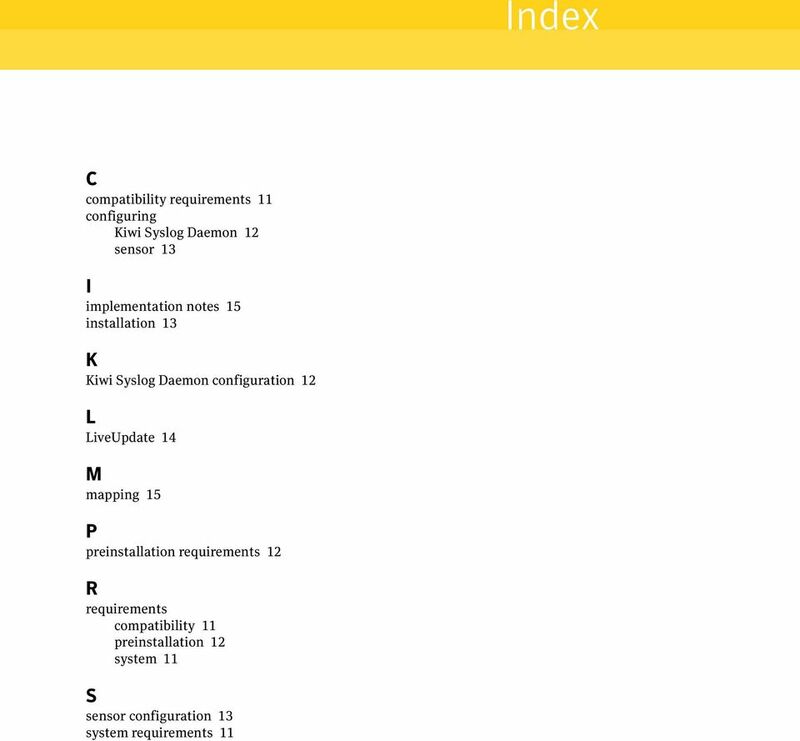 Documentation version 4.0 Legal Notice Copyright 2007 Symantec Corporation. All rights reserved. Symantec, the Symantec logo, LiveUpdate, Symantec AntiVirus, and Symantec Security Response are trademarks or registered trademarks of Symantec Corporation or its affiliates in the U.S. and other countries. Other names may be trademarks of their respective owners. Microsoft, Windows, and Window 2000 are trademarks or registered trademarks of Microsoft Corporation. This product includes software that was developed by the Apache Software Foundation. Other brands and product names mentioned in this manual may be trademarks or registered trademarks of their respective companies and are hereby acknowledged. Kiwi Syslog Daemon is freeware developed by Kiwi Enterprises. The product described in this document is distributed under licenses restricting its use, copying, distribution, and decompilation/reverse engineering. No part of this document may be reproduced in any form by any means without prior written authorization of Symantec Corporation and its licensors, if any. THE DOCUMENTATION IS PROVIDED "AS IS" AND ALL EXPRESS OR IMPLIED CONDITIONS, REPRESENTATIONS AND WARRANTIES, INCLUDING ANY IMPLIED WARRANTY OF MERCHANTABILITY, FITNESS FOR A PARTICULAR PURPOSE OR NON-INFRINGEMENT, ARE DISCLAIMED, EXCEPT TO THE EXTENT THAT SUCH DISCLAIMERS ARE HELD TO BE LEGALLY INVALID. SYMANTEC CORPORATION SHALL NOT BE LIABLE FOR INCIDENTAL OR CONSEQUENTIAL DAMAGES IN CONNECTION WITH THE FURNISHING, PERFORMANCE, OR USE OF THIS DOCUMENTATION. THE INFORMATION CONTAINED IN THIS DOCUMENTATION IS SUBJECT TO CHANGE WITHOUT NOTICE. The Licensed Software and Documentation are deemed to be commercial computer software as defined in FAR and subject to restricted rights as defined in FAR Section "Commercial Computer Software - Restricted Rights" and DFARS , "Rights in Commercial Computer Software or Commercial Computer Software Documentation", as applicable, and any successor regulations. Any use, modification, reproduction release, performance, display or disclosure of the Licensed Software and Documentation by the U.S. Government shall be solely in accordance with the terms of this Agreement. 4 Technical Support Symantec Technical Support maintains support centers globally. Technical Support s primary role is to respond to specific queries about product feature and function, installation, and configuration. The Technical Support group also authors content for our online Knowledge Base. The Technical Support group works collaboratively with the other functional areas within Symantec to answer your questions in a timely fashion. For example, the Technical Support group works with Product Engineering and Symantec Security Response to provide alerting services and virus definition updates. Symantec s maintenance offerings include the following: A range of support options that give you the flexibility to select the right amount of service for any size organization A telephone and web-based support that provides rapid response and up-to-the-minute information Upgrade insurance that delivers automatic software upgrade protection Global support that is available 24 hours a day, 7 days a week worldwide. Support is provided in a variety of languages for those customers that are enrolled in the Platinum Support program Advanced features, including Technical Account Management For information about Symantec s Maintenance Programs, you can visit our Web site at the following URL: Contacting Technical Support Select your country or language under Global Support. The specific features that are available may vary based on the level of maintenance that was purchased and the specific product that you are using. Customers with a current maintenance agreement may access Technical Support information at the following URL: Select your region or language under Global Support. Before contacting Technical Support, make sure you have satisfied the system requirements that are listed in your product documentation. Also, you should be at the computer on which the problem occurred, in case it is necessary to recreate the problem. 6 Advice about Symantec's technical support options Nontechnical presales questions Issues that are related to CD-ROMs or manuals Maintenance agreement resources Additional Enterprise services If you want to contact Symantec regarding an existing maintenance agreement, please contact the maintenance agreement administration team for your region as follows: Asia-Pacific and Japan: Europe, Middle-East, and Africa: North America and Latin America: Symantec offers a comprehensive set of services that allow you to maximize your investment in Symantec products and to develop your knowledge, expertise, and global insight, which enable you to manage your business risks proactively. Enterprise services that are available include the following: Symantec Early Warning Solutions These solutions provide early warning of cyber attacks, comprehensive threat analysis, and countermeasures to prevent attacks before they occur. Managed Security Services Consulting Services Educational Services These services remove the burden of managing and monitoring security devices and events, ensuring rapid response to real threats. Symantec Consulting Services provide on-site technical expertise from Symantec and its trusted partners. Symantec Consulting Services offer a variety of prepackaged and customizable options that include assessment, design, implementation, monitoring and management capabilities, each focused on establishing and maintaining the integrity and availability of your IT resources. Educational Services provide a full array of technical training, security education, security certification, and awareness communication programs. 7 To access more information about Enterprise services, please visit our Web site at the following URL: Select your country or language from the site index. 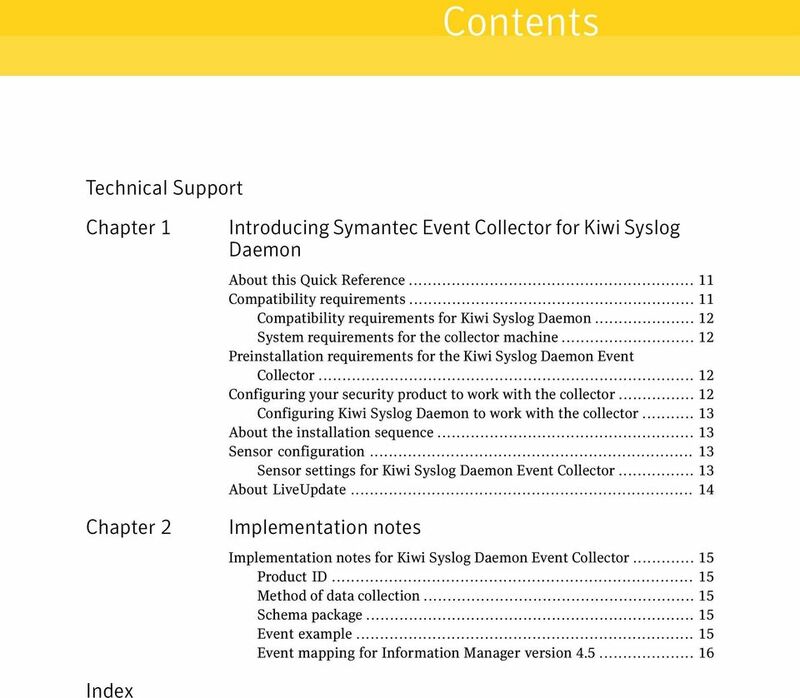 11 Chapter 1 Introducing Symantec Event Collector for Kiwi Syslog Daemon This chapter includes the following topics: About this Quick Reference Compatibility requirements Preinstallation requirements for the Kiwi Syslog Daemon Event Collector Configuring your security product to work with the collector About the installation sequence Sensor configuration About LiveUpdate About this Quick Reference This quick reference includes information that is specific to Symantec Event Collector for Kiwi Syslog Daemon. 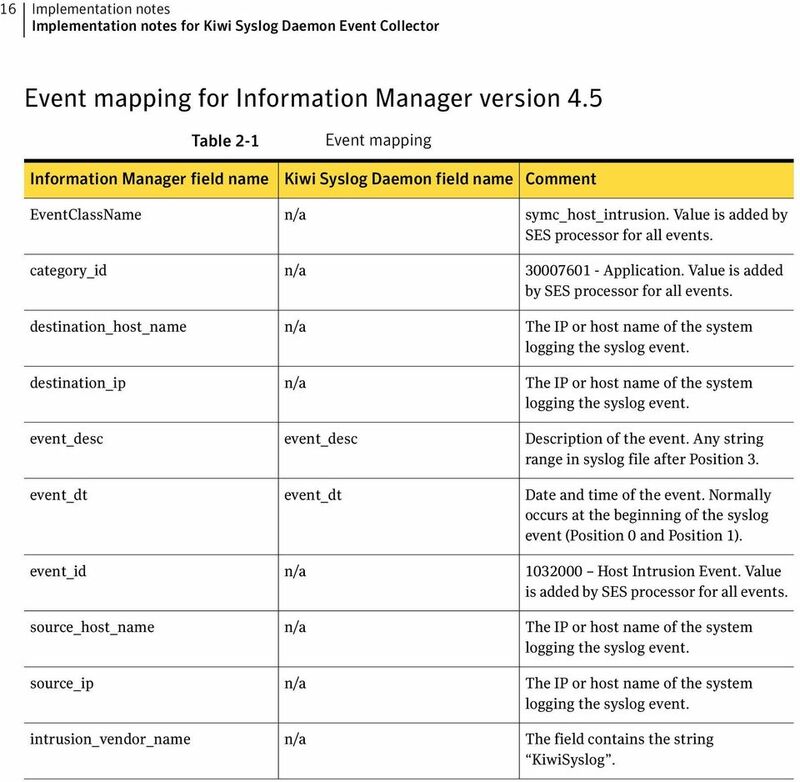 For detailed information on how to install and configure event collectors, please see the Symantec Event Collectors Integration Guide. Compatibility requirements The collector is compatible with specific versions of the security product and is compatible with certain operating systems. 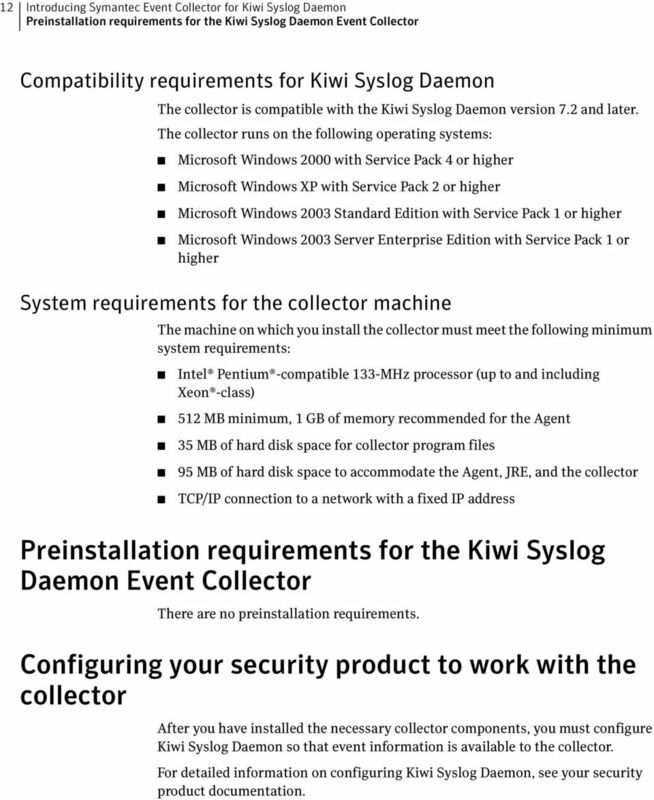 12 12 Introducing Symantec Event Collector for Kiwi Syslog Daemon Preinstallation requirements for the Kiwi Syslog Daemon Event Collector Compatibility requirements for Kiwi Syslog Daemon The collector is compatible with the Kiwi Syslog Daemon version 7.2 and later. The collector runs on the following operating systems: Microsoft Windows 2000 with Service Pack 4 or higher Microsoft Windows XP with Service Pack 2 or higher Microsoft Windows 2003 Standard Edition with Service Pack 1 or higher Microsoft Windows 2003 Server Enterprise Edition with Service Pack 1 or higher System requirements for the collector machine The machine on which you install the collector must meet the following minimum system requirements: Intel Pentium -compatible 133-MHz processor (up to and including Xeon -class) 512 MB minimum, 1 GB of memory recommended for the Agent 35 MB of hard disk space for collector program files 95 MB of hard disk space to accommodate the Agent, JRE, and the collector TCP/IP connection to a network with a fixed IP address Preinstallation requirements for the Kiwi Syslog Daemon Event Collector There are no preinstallation requirements. Configuring your security product to work with the collector After you have installed the necessary collector components, you must configure Kiwi Syslog Daemon so that event information is available to the collector. For detailed information on configuring Kiwi Syslog Daemon, see your security product documentation. 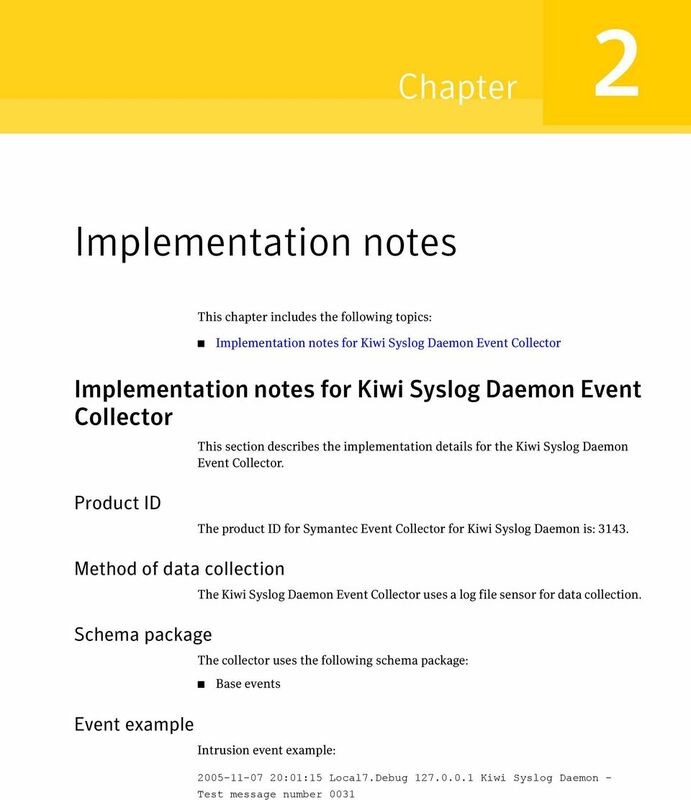 14 14 Introducing Symantec Event Collector for Kiwi Syslog Daemon About LiveUpdate Specify the path to the log file on the security product machine. The default log file directory is: C:\Program Files\Syslogd. See Configuring your security product to work with the collector on page 12. Log File Name Specify the name of the log file. The default log file name is Logs. You can also leave this property blank to read all files in the log file directory. Reading Mode Specify whether to check for new log files after reaching the end of the current log file, or to wait for new events to be added to the current log file. 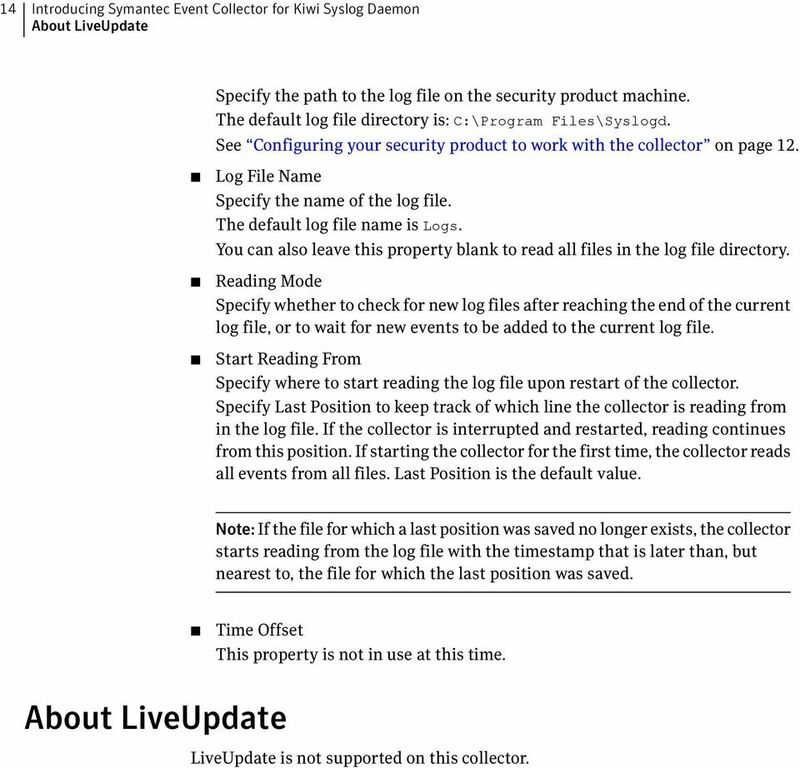 Start Reading From Specify where to start reading the log file upon restart of the collector. Specify Last Position to keep track of which line the collector is reading from in the log file. If the collector is interrupted and restarted, reading continues from this position. If starting the collector for the first time, the collector reads all events from all files. Last Position is the default value. Note: If the file for which a last position was saved no longer exists, the collector starts reading from the log file with the timestamp that is later than, but nearest to, the file for which the last position was saved. Time Offset This property is not in use at this time. About LiveUpdate LiveUpdate is not supported on this collector. 16 16 Implementation notes Implementation notes for Kiwi Syslog Daemon Event Collector Event mapping for Information Manager version 4.5 Table 2-1 Information Manager field name EventClassName category_id destination_host_name destination_ip event_desc event_dt event_id source_host_name source_ip intrusion_vendor_name Event mapping Kiwi Syslog Daemon field name n/a n/a n/a n/a event_desc event_dt n/a n/a n/a n/a Comment symc_host_intrusion. Value is added by SES processor for all events Application. Value is added by SES processor for all events. The IP or host name of the system logging the syslog event. The IP or host name of the system logging the syslog event. Description of the event. Any string range in syslog file after Position 3. Date and time of the event. Normally occurs at the beginning of the syslog event (Position 0 and Position 1) Host Intrusion Event. Value is added by SES processor for all events. The IP or host name of the system logging the syslog event. The IP or host name of the system logging the syslog event. The field contains the string KiwiSyslog. 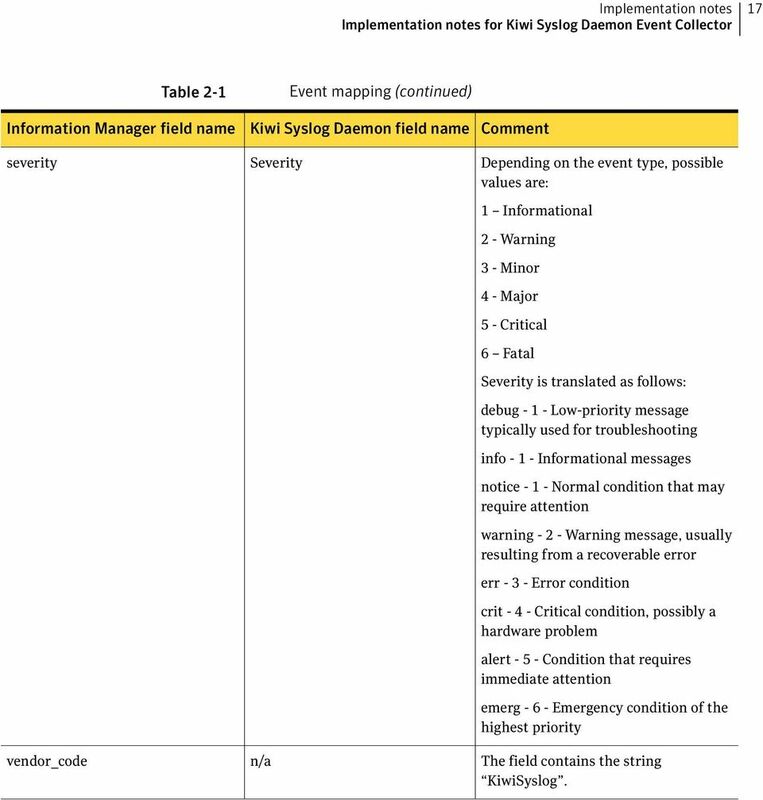 17 Implementation notes Implementation notes for Kiwi Syslog Daemon Event Collector 17 Table 2-1 Information Manager field name severity vendor_code Event mapping (continued) Kiwi Syslog Daemon field name Severity n/a Comment Depending on the event type, possible values are: 1 Informational 2 - Warning 3 - Minor 4 - Major 5 - Critical 6 Fatal Severity is translated as follows: debug Low-priority message typically used for troubleshooting info Informational messages notice Normal condition that may require attention warning Warning message, usually resulting from a recoverable error err Error condition crit Critical condition, possibly a hardware problem alert Condition that requires immediate attention emerg Emergency condition of the highest priority The field contains the string KiwiSyslog.